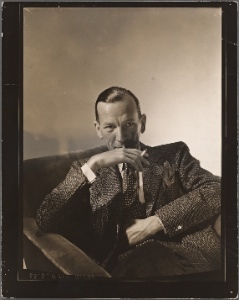 Noel Coward, that is, by going for the full immersion experience at NYPL of the Performing Arts at Lincoln Center’s show that covers every inch of his creative life. Spend an hour or two probing the films, videos, music, and items that overflow at the exhibition, Star Quality: The World of Noel Coward. It will definitely inspire you to write that musical revue, star in your own drama, entertain around a piano, paint a landscape that you love, snag a cameo in a film, be a friend to one and all, and party like it’s 1999. You can begin by visiting the special website the NYPL has created and digging around in the decade-by-decade archive that keeps unfurling before you. Not all of the photos are dated, but you’ll see stage production photos from the original 1920s productions of Easy Virtue and The Vortex, Private Lives from the 30s, and Blithe Spirit from the 40s (go, Mildred Natwick!). There’s plenty of Lunt-Fontanne to go around in subsequent decades, and some classic shots of Elaine Stritch in Sail Away from the 60s. If you need a quick refresher on all Coward’s shows, check out his portion of the Playbill vault. But the walk-through at Lincoln Center goes well beyond just the songs, reviews, and drawing-room comedies with tales of his debut as a precocious child actor, iconic dressing gowns, inscribed gold and silver cigarette cases, a piano festooned with his favorite celebrity portraits, his “spy” career during WWII, his Vegas career (tuxedo in the desert? ), and his TV/film work. In fact, the lights, camera, and action are on full display with NYPL’s multiple viewing stations around the show, including some early 1930s footage of Coward’s musical stage reviews that are filmed from the wings, including a parade of “Children of the Ritz” and the Broadway debut of “Mad About the Boy”. Go to see this now, and don’t miss the slide show of recently discovered private 3-D photos from the 1950s that is just inside the door. This entry was posted in Art, Museums, Theater and tagged arts, culture, museums, theater by mssusanb. Bookmark the permalink. or go for a paid option? There are so many options out there that I’m totally overwhelmed .. Any tips? Thank you! Thanks for the kind words! Everyone is shifting toward WordPress on a paid option, so I’d encourage that.